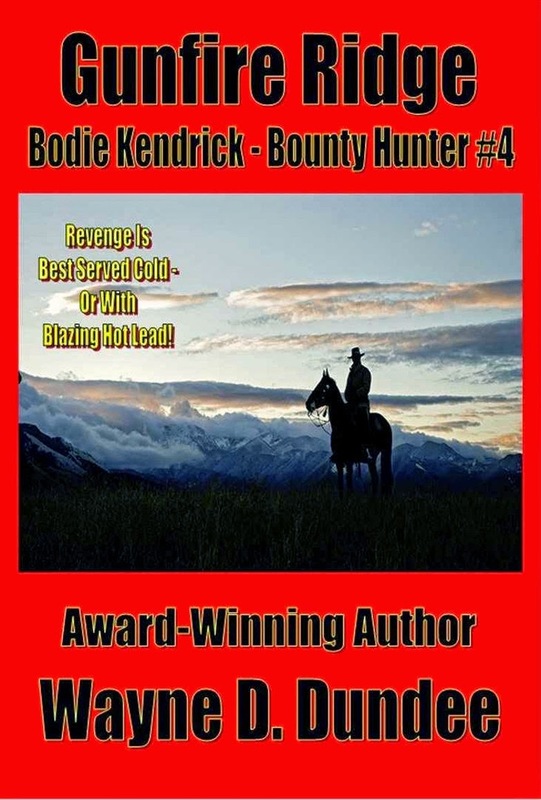 Bounty hunter Bodie Kendrick makes a welcome return in GUNFIRE RIDGE, Wayne D. Dundee's latest novel. This time he's in pursuit of a gang of outlaws that's been wreaking havoc in the Nebraska panhandle, far from Kendrick's usual southwestern haunts. In addition to the bounties on the heads of his quarry, Kendrick also has a personal score to settle with the men he's hunting. But then at the same time, he also finds himself being hunted by a group of killers who have a grudge of their own against him. It's the proverbial "rock and a hard place" situation and a very dangerous spot for Kendrick to be caught in. Luckily he has some help from a gun-toting soiled dove and a troop of Buffalo Soldiers. As usual with Dundee's work, the action in GUNFIRE RIDGE is fast-paced and hardboiled and a prime example of why he's considered one of the best Western writers in the business these days. Bodie Kendrick is a strong, very likable hero, and the other characters are excellent as well. If you're a Western fan, Dundee always provides great entertainment. Highly recommended.